Startling food news: Sugar doesn't melt, it decomposes! Just because everyone knows it's true, doesn't make it so. For centuries, candy makers have wrung their hands over the vagaries of sugar. See, sugar doesn't always melt at the same temperature. Turns out, that's because it's not really melting. It's decomposing. 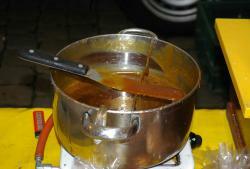 "We saw different results depending on how quickly we heated the sucrose. That led us to believe that molecules were beginning to break down as part of a kinetic process," said Shelly J. Schmidt, a University of Illinois professor of food chemistry. Schmidt said a true or thermodynamic melting material, which melts at a consistent, repeatable temperature, retains its chemical identity when transitioning from the solid to the liquid state. She and Lee used high-performance liquid chromatography to see if sucrose was sucrose both before and after "melting." It wasn't. "As soon as we detected melting, decomposition components of sucrose started showing up," she said. To distinguish "melting" caused by decomposition from thermodynamic melting, the researchers have coined a new name—"apparent melting." Schmidt and her colleagues have shown that glucose and fructose are also apparent melting materials." Disaster junkies, prepare to be disappointed. Forecasters say that the river will remain at this level for a few days before falling at the end of the week. And they caution that the model only includes precipitation anticipated in the next 24 hours. A lot of rain in the next few days could cause the river to rise. Again. 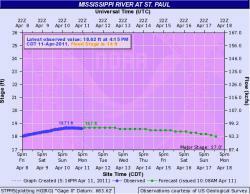 The Mississippi River at downtown St. Paul crested this morning around 10:00 at 19.1 feet, making this year's flood the 8th highest flood of record. So far. You see, we're not out of the woods yet. There's a good possibility that we may see a second crest, and the extent of that flooding will be determined by how quickly temperatures warm up (and stay warm) and whether or not we get any big rainstorms. 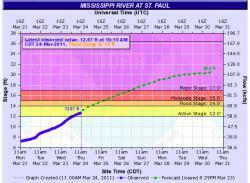 The Mississippi River @ downtown St. Paul is at "action stage" right now - 12.63' - headed to "flood stage" by midnight. Yesterday, it was rising about an inch an hour, but the cold has slowed things down just a bit. And the continued cold means that the river should crest (the first time, anyway) quite a bit lower than earlier predictions. Visit the Hydrological Prediction Service for details, or follow the whole flood saga on Science Buzz. Panorama of Mississippi pre-flood: explore the image! Here is a gigapan shot I took of the river yesterday. I will try to take a panorama every other day(at least). I intend to capture more of the river west in future shots. BTW: pay special attention to the crazy time capture of a really long train that was passing by. Please pass on the link to whomever you feel would be interested. COLDER AIR MOVES INTO THE AREA LATER IN THE WEEK. THIS DEVELOPING SITUATION AND ISSUE FOLLOW UP STATEMENTS." So stay tuned. The 7-day outlook gets updated as needed. 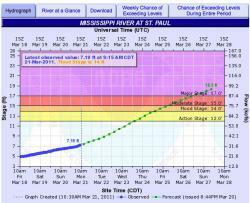 The Advanced Hydrological Prediction Service has released a new short-term forecast for the Mississippi River at downtown St. Paul. (There's still too much uncertainty in the models to make a new crest prediction for the area.) 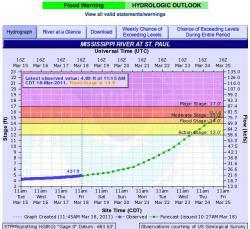 We should see the river rise above flood stage by midday on Thursday, 3/24. Impending flooding causes "state of local emergency"
Yesterday, Mayor Coleman declared a "state of local emergency." The declaration clears the way for the City to start tracking flood-related expenses, in the hopes of getting some of them reimbursed. And there will be lots of expenses this year. There's a 50% chance of a record crest (beating the high water mark of 26.4' in 1965), and a 70% of a crest above 17'. Workers at the downtown airport began installing the flood wall yesterday, and residents of Lowertown and the Upper Landing are being asked to have a plan in case they're evacuated. The lower portion of Lilydale Regional Park, parts of Harriet Island, and the low-lying areas of Shepard/Warner Road will likely be submerged. With several days of above-freezing temperatures and some rain in the forecast, the National Weather Service expects we could start to see flooding in downtown St. Paul by the weekend. 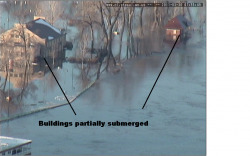 Visit the City of St. Paul flood preparation page, or check out the Science Buzz 2011 flood feature. Oh, and here's our shot-a-day rivercam, and our hourly-image feed.